Inventory We are a resale marketplace, not a box office or venue. Ticket prices may exceed face value. This site is not owned by Ralph Wilson Stadium . Ralph Wilson Stadium has been home to the National Football League's Buffalo Bills since it's opening in 1973. The Ralph Wilson Stadium box office is located at 1 Bills Drive in Orchard Park, New York. The stadium has a seating capacity of 73,079 after being reduced in 1998 to include more luxury boxes and club seats. The venue is named after Bills owner and founder Ralph Wilson. Ralph Wilson Stadium tickets used to include big name concerts traveling through the Buffalo area. Bands like The Who, The Grateful Dead, Van Halen, Metallica, and 'N Sync have played the stadium which has not had a concert scheduled since 2003. 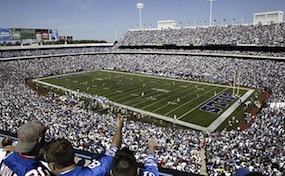 RalphWilson.StadiumBuffalo.com is not currently affiliated with any official website, team, venue, and or box office. We are privately owned and operated concentrating in all online sales in the secondary market. Ticket prices may be below or above face value and can change rapidly with market conditions. To order tickets to all Ralph Wilson Stadium Buffalo events follow the steps online through checkout or pick up the phone and call our operators at anytime.